The Feast of St. Rocco Festival began in 1978 as the brainchild of Father Michael Guarino. He sought to create a religious, social and cultural event in Franklin that followed the format of traditional Italian festivals. On a visit to what were once the grounds of the St. Mary School convent, Fr. Guarino found a statue of St. Rocco and his idea found a saint to celebrate in such a festival. St Rocco, the patron saint of healing, was born in the 13th century to a wealth family in France but gave away his inheritance and set out as a pilgrim who ministered to the sick, especially those suffering from plague. Having healed many people through intercessory prayer without contracting the disease itself, he finally succumbed to illness and in his great suffering, went away to a small hut the woods, so as not to be a burden on others. He was ministered to be a dog who brought him bread daily, and a spring miraculously appeared near the hut providing him with water. Ironically, with the feast focused on healing, accessibility is a major challenge for many parishioners. Change is taking place not only with the evolution of the festival, but also within the physical building of St. Mary’s church itself. During the Festival Finale, construction will be in full swing for an addition to the church that will include an accessible entrance, indoor elevator, restrooms on both levels and a food service area. This addition to the church will also feature a permanent location for the statue of St. Rocco to reside, where people can visit with the saint and pray year-round in good weather and bad. Since its inception, the festival has always included three separate Masses. Kicking off the week of the feast is the Opening Mass at 10:30 on Sunday, August 5 at the church. This Mass is celebrated for the deceased friends and family listed in the St. Rocco program book. At this Mass, rolls that have been blessed are given out to all who attend, just as St. Rocco’s faithful dog brought him bread when he was sick, that helped him survive. This year, the 40th and final Closing Mass for the Feast of St Rocco will be held on Sunday, August 12 at 10:30 at the church. Following Mass, a procession will carry the statue of St. Rocco from the church to the field. As the food and festival portion of this feast comes to an end, it paves the way for new traditions and ways to celebrate faith, family and friends within the parish. With changes to the church, the statue of St Rocco will be permanently housed in the new addition where people can pray at any time. And while our faith and town community may not see the food booths and rides on the fairgrounds next year, new traditions will bloom that are compatible with today’s lifestyle and culture. Don’t miss this historic event. Come for the rides, Come for the people. Come for the healing. 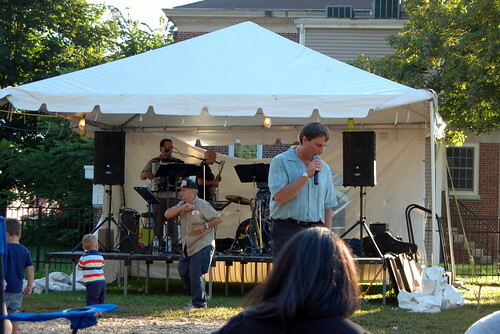 Just come … be a part of the St. Rocco Festival Food Finale!